Now that I am finally home and back into some kind of miss shaped routine, I can get back into this blogging thing. I know I may have been ambitious with my attempts at weekly blogging. I just set the date of August 29th to submit my thesis, so blogging will take a back seat for the next six months. 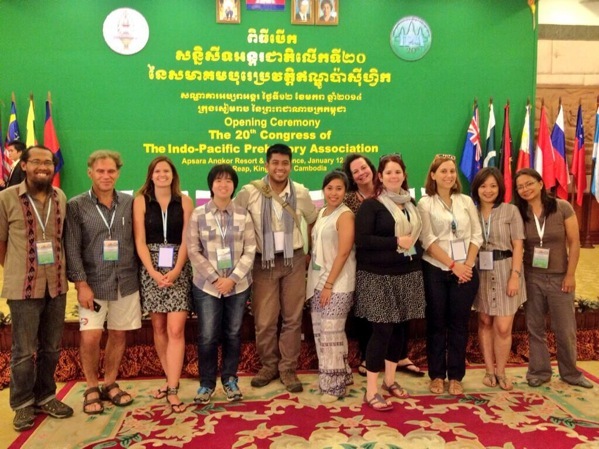 Getting back into it… lets talk about the IPPA conference in Siem Reap. The conference was above and beyond expectations, so I’m going to give you my top 5 highlights. Andre Womack from Yale University using magnetometer survey in the Tao River Valley of the southern Gansu Provence, China. I haven’t really seen or researched much on this technology but have been very interested in its application. Andrew gave a fantastic presentation (despite the odd technical glitch which was handled with style), clearly presenting the application of the technology and the results obtained. It’s a piece of technology that I’d like to get my hands on in the future. Michael Graves presented on behalf of a team from the University of New Mexico on the traditional irrigation-based agricultural systems in Windward Kohala, Hawai’I. The team used remote sensing, archival and historical maps and archaeology survey to investigate the extensive network of irrigation systems. While the methods have been used before, the data was amazing. The network of channels that transported water over vast distances was very impressive! Leee Anthony M. Neri discussed his work in the Philippines using geochemical sourcing. I particularly loved this presentation because this is something that I am trying to achieve with my own thesis. While I am not sourcing material, I am using geochemical methods. He also discussed a new technique that I wasn’t familiar with and would love to hear more about. Finally, Helen Lewis ended the session with a discussion paper. The main message I took away from this paper was the need to have context when using non-destructive methods. Without the context of what we are investigating, we are literally shooting in the dark. Also, Helen made the point that these methods need to be used in conjunction with archaeological investigation. I love all things Lao, so it was so great to see all the wonderful and exciting work coming from the country. A lot of hard work went into getting a delegation of Lao nationals at IPPA this year and it was paid off with the excellent presentations given. We were presented sites from the South at Seppon where a current copper and gold mine are digging up evidence of Iron Age copper mining. The work being undertaken in Vientiane and the tireless efforts of the small team of archaeologists that take care of the entirety of Lao national heritage and finally, we got to see the Hoabinian cave sites in the North and a presentation from the Pain of Jars. 3. Round table discussion on the Moat sites in Mainland Southeast Asia. This spectacular event was organised by Dr Alison Carter and Dr Nam Kim. The round table had ten experts in the field of moated sites from Thailand, Cambodia and Vietnam discussing the sites they investigate and comparing and contrasting the differences and similarities in these sites. As I am investigating a moated, mound site formation for my masters thesis, so I was mostly beside myself for this session. Highlight from this session was Dougald O’Reilly discussing the moated site comparisons between NE Thailand and Cambodia; Roland Fletcher discussing radial settlements of the Angkor region; and Matt Gallon discussing the Dvaravatie sites of Khampaeng Saen in central Thailand. This session gave me a massive boot to keep powering on in my thesis. Meeting fellow tweets from the family of SE Asian archaeology was an unexpected bonus at this conference. I knew they were out there and it was awesome to put a face to the twitter handles. Many thanks to those who made the meet up happen and for all the amazing tweets coming out of sessions. There were so many conflicting sessions that I wanted to go to, so having a feed of information online made the conference all the more better. The trip to Angkor Wat and Angkor Thom may have been the best and worst aspect of the conference. It was the best because I got to see Angkor with all my new friends. It was the worst because there was 4-500 of us together. I first saw Angkor in 2011 with my friend Alison. It is a much better experience seeing with one of your closest friends and not 500 of them. Never the less it was an epic day and an epic amount of planning went into getting us all there and fed. Many thanks to the organisers for undertaking such a massive event of epic proportions. The IPPA conference was a fantastic week. It is like having a family reunion, seeing all the wonderful people who are involved in SE Asian archaeology. Next conference, I would love to see a session on the modern face of archaeology, online networking, blogging research and the new and inventive ways people are getting their research funded. I wish IPPA came around sooner. I can’t wait till the next one! Graves, M. Birkmann, J. Oxley, M. Morehouse, J. Kikiloi, K. Uyeoka, K. and Plunkett, S. (2014) Traditional Irrigation-Based Argricultral Systems in Windward Kohala, Hawai’I Island. Presented at the Indo-Pacific Prehistory Association Conference 12-18 January 2014, Siem Reap: Cambodia. Lewis, H. (2014) Geoarchaeology- Non-Destructive Survey methods: Discussion. Presented at the Indo-Pacific Prehistory Association Conference 12-18 January 2014, Siem Reap: Cambodia. Neri, L. A. M (2014) Geochemical Sources in the Philippines. Presented at the Indo-Pacific Prehistory Association Conference 12-18 January 2014, Siem Reap: Cambodia. Womack, A. (2014) Looking Into the Losess: Preliminary Results from Geophysical remote Sensing at the Qijiaping Site in Gansu, China. Presented at the Indo-Pacific Prehistory Association Conference 12-18 January 2014, Siem Reap: Cambodia.